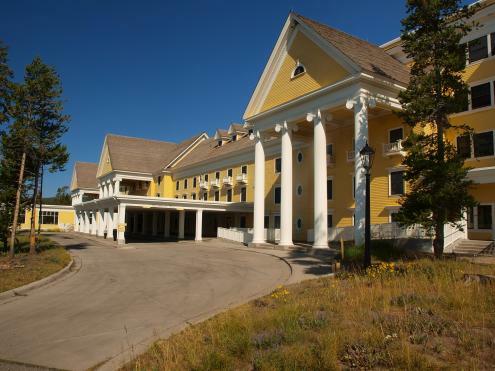 The majestic Lake Hotel sets right on the banks of Yellowstone Lake, overlooking mountains and blue water as far as the eye can see. With its grand opening over 100 years ago in 1891, the Lake Hotel is the oldest operating hotel in the National Park system in the country. Imagine what it must have been like to be a visitor in the 1890s and pull up to this elegant hotel in a horse-drawn stagecoach. There are over 300 rooms in the hotel in addition to 100+ cabins behind the hotel. Guests enjoy sitting in the sunroom of the hotel overlooking the lake. During the summer months you will be treated to the graceful music of the string quartet or the local pianist that play enjoyable music in the evenings. There is also a lounge, dining room, deli, and gift shop at your convinience right inside the hotel. Here you can live out the cliche of a long walk on the beach with the setting sun off in the distance. Other favorite activites are boat rentals and scenic cruises on the lake which operate out of the Bridge Bay Marina a couple miles down the road. The nearest coin laundry is available just down the road from the hotel at the Lake Lodge.